SW-406 - Dark Magma - (brush on) St..
MB1529 Vintage Truck Plaque in Ceramic Cone 0..
MB1531 Mermaid Plaque in Ceramic Cone 04 Bisq..
MB1530 Unicorn Plaque in ready to paint Cone ..
CN074 Really Red Concept (2 ounce) Under-glaze for Bisque by Duncan..
1. Apply to shelf cone 04 bisque. 2. Fire to shelf cone 06. 3. Clean up with water. 4. For clear glaze application, brush-on or dip clear glaze over Concepts. 5. Stilt and fire to shelf cone 06. 6. Water clean-up. CN074 Really Red Concept (2 ounce) Under-glaz..
Duncan® True Matte Pastels™ exude modern appeal, as pastels are here to stay and have evolved from sweet to sophisticated. TM 326 4oz Sting Gray True Matte Glaze by Dun..
TM 326 16oz Sting Gray True Matte Paste..
TM 325 4oz Sangria True Matte Glaze by Duncan..
TM 325 16oz Sangria True Matte Pastel G..
TM 323 4oz Peacock True Matte Glaze by Duncan..
TM 323 16oz Peacock True Matte Pastel G..
TM 322 4 oz Taupe True Matte Glaze by Duncan ..
TM 322 16 oz Taupe True Matte Glaze by Duncan..
TM 320 4 oz No Way Rose True Matte Glaze.. Approximately 23 in. x 23 in. opening and 22 in. high: 5.7 cubic feet, 32 bowls. Skutt Ceramic Kilns KMT1022 - 240 v.. Adds 1"-10" to a Pacifica Potter's Wheel height for potters preferring a more upright throwing position. Pacifica Short Leg Extension - AYou love your.. Comfortable, supportive, and adjustable up, down, toward and away from the wheel. Attaches to Brent, Pacifica and other popular models. Pacifica SeatYou love your wheel, you will lo..
Nutcracker - in ready to paint - ..
Stocking Dish - in ready to paint..
SG2498 Noah's Ark Santa in ready to..
SG1567 Noah's Ark Santa in ready to..
SG1567 Santa with Puppets in ready..
SG1567 Santa with Puppets in ..
SK1624 English Santa in ready to paint, ..
SK1624 English Santa in ready to pa..
SG2383 Santa with Cats in ready to paint..
SG2383 Santa with Cats in ready to pain..
SG2845 Lace Santa in ready to paint, Con..
SG2845 Lace Santa in ready to paint..
SG2700 Southwest Santa in ready to..
SG2700 Southwest Santa in ready to paint, Con..
SKA0388 Santa on Chimney in ready to pai..
SKA0388 Santa on Chimney in ready t..
SG3373 Santa Sitting on a Harley in read..
SG3373 Santa sitting on a Harley in ready to ..
SDH1919 Large Snowman Waving in ready to pain..
SDH1919 Lg. Snowman Waving in ready to paint,..
Skutt Ceramic Kilns KMT 818 - 240 v..
TL502 Fine Writer Tips10 to a pack20 Gauge&nb..
TL501 Medium Writer Tips10 to a pack18 Gauge&..
TL500 Large Writer Tips10 to a pack16 Gauge&n..
3 Tip Sizes Fine (20 gauge), Medium (18 gauge), Large (16 gauge). TL499 Writer Bottles and Tips3 Writer Bottles..
31239 Large Canister 9 T x 7 Dia..
21692 Rock Star Picture Frame6 x 6..
40069 Talavera Spoon Rest - in Cera..
40067 Talavera Platter - in Ceramic.. Remove tip from French Dimensions and stir paint with thin stick for even consistency. Squeeze paint over the incised lines on plate. Dry. Bright Straw in center of flower and small leaves in large outer leaves. Neon Red in center flower petals and small circles in leaves and border design. Light Delft around central flower, alternate squares in trims around the flower and outer rim. Bright Green in leaves surrounding the central flower. Dark Delft in remaining small squares around flower and rim and unpainted area around leaves. Let dry. Brush three coats of Dark Delft on back of platter. Let dry. NOTE: As an alternate method, you may also paint designs in first, dry, then outline with French Dimensions. 40066 Talavera Charger Plate - in C..
40065 Talavera Dinner Plate - in Ce..
40064 Talavera Salad Plate - in Cer..
40068 Talavera Cereal Bowl in ready..
40062 Talavera Mug 12 oz. in Ceramic Co..
40062 Talavera Mug 12 oz. in Ceramic Cone 04..
40063 Talavera Mug 16 oz. in Ceramic Co..
40063 Talavera Mug 16 oz. in Ceramic Cone 04..
29214 Donut Box with Sprinkles - in.. The KM1027 has everything most potters need in a kiln. The chamber size is tall enough to fire a 23" tall pot and wide enough to hold a 21" platter. It comes standard with the smartest controller on the market (it will even calculate your cost of firing) and has a lid lifter to boot! Click on the tabs above to find out more. Approximately 23 in. x 23 in. opening and 27 in. high: 7 cubic feet, 38 bowls. Skutt Ceramic Kilns KMT1027-240 vol.. Approximately 18 in. x 18 in. opening and 22 in. high: 3.2 cubic feet, 15 bowls. Skutt Ceramic Kilns KMT 822 - 240 v.. Approximately 28 in. x 28 in. opening and 18 in. high: 6.6 cubic feet, 42 bowls. Skutt Ceramic Kilns KMT1218-240 vol.. Approximately 28 in. x 28 in. opening and 22 in. high: 8.1 cubic feet, 46 bowls. Skutt Ceramic Kilns KMT1222 - 240 v..
Look in almost any classroom or Contemporary Studio and you will find a KM1227-3. 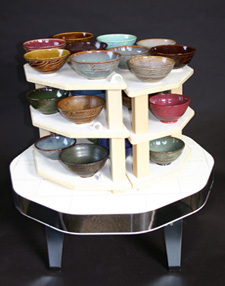 It is hands down the most popular low fire production kiln on the market. With the largest diameter chamber size of our round top loading kilns, it can pump out volume and size! Approximately 28 in. x 28 in. opening and 27 in. high: 9.9 cubic feet, 50 bowls. Skutt Ceramic Kilns KMT1227 - 240 v.. Combine AC-310 Silkscreen Medium with underglazes, Stroke & Coat® or Designer Liner to create a ceramic "paste", which is then rubbed through the screen onto your surface. Designer Silkscreens can also be used with acrylics or fabric paint. DSS0157 Under the Sea Designer Silk..
DSS0156 Llama Drama Designer Silk S..
DSS0155 Comic Expressions Designer ..
DSS0154 Cute Dragons Designer Silk ..
DSS0153 Farmhouse Designer Silk Scr..
CG-984 Ladybug (4 ounce) Jungle Gem Crys.. Ceramic Surface Directions: Use the stencil to make patterns on ceramic bisque or greenware by applying your favorite non-moving glazes such as Stroke & Coat or Foundations over the unglazed surface or by layering glaze. Use dimensional glazes, such as Stroke & Coat Accents or Sculpting Medium, to create embossed designs. Texturing Clay; Press stencil into clay to create texture and / or use teh stencil as a template to carve designs. These stencils are sturdy - yet pliable enough to wrap around a curved surface. SL456 Camo Stencil by Mayco ColorsAdd creativ..
SL448 Doily Stencil by Mayco ColorsAdd creati..
SL443 Tin Ceiling Stencil by Mayco ColorsAdd..
Bring some welcoming island ambiance into your space with this fun Pineapple Box! Accent the abundance of texture with Duncan® True Matte Pastels™ for modern appeal that looks chic in any room in the house. Brush insides of all three lids and bottoms with three coats of Marshmallow Crème. Let dry. Brush three coats Marshmallow Crème to leaves at top of each lid. Let dry. Brush three coats Minted to the remainder of one of the boxes, three coats Blushing to the other and Moonlight to the third box. Let dry. Stilt lids and boxes on kiln shelf and fire to cone 06. While appearing to be an ordinary coffee mug, this unique design features tentacles that climb out of the mug and one forms the handle! So, add your colors of choice and start your morning with a cool cephalopod mug! Brush on 1 coat Bright Grape to tentacles. Let dry. With a damp sponge, carefully wipe back paint to remove some glaze from tentacles. Let dry. Sponge on two coats Light Grape to tentacles. Let dry. Brush on three coats Black to inside, bottom, and outside of mug. Let dry. Brush on two coats of Pure Brilliance to tentacles. Let dry. 38273 Tentacle Mug 16 oz. in Ceramic Co..
38098 T-Rex Mug 14 oz. in Ceramic Cone 04 B..
38104 Unicorn Mug 12 oz. in Ceramic Cone 04..
Pirate Mug - 16 oz. 38257 Pirate Mug - in ready to pa..
CG-988 Fireflies (4 ounce) Jungle ..
CG-991 Mountain Moss Jungle Gem C..
MB1508 Vintage Truck Container in Ceramic Con..
Creative Crafts is Louisiana's Largest Wholesale / Retail Ceramic Supplier for Mayco Colors, Duncan Colors, Mayco Ceramic Bisque, Duncan Ceramic Bisque, Hand Cast Ceramic Bisque, Kemper Tools, Xiem Tools, Royal Brushes, Skutt Kilns Laguna Clay, Mackies Casting Slip and more, all under one roof for your complete one stop & shop online ceramic store. Creative Crafts is a family owned and operated business established in 1968 and located in Louisiana. We have been proudly serving the needs of today's do it yourself enthusiasts, potters, Studio's, artists, schools and producers of fine ceramic table and gift-ware. Monday 9:00 A.M. til 4: P.M.
Tuesday 9:00 A.M. til 4: P.M.
Wednesday 9:00 A.M. til 4: P.M.
Thursday 9:00 A.M. til 4: P.M.
Friday 9:00 A.M. til 4: P.M.
and we are open on the first Saturday of each month 10:00 A.M. til 2:00 P.M.